How to change a plug, how to change a fuse. myelectronicstec.com your freindly electronics experts. Pat testing Sheffield, Barnsley, Rotherham. How to change a plug or replace a fuse. A helpful guide by www.myelectronicstec.com. How to change a UK electric plug. Only attempt this task if you feel competent, if in doubt call Myelectronicstec.com for technical support. From time to time you may find it necessary to replace a damaged UK electric plug or replace a fuse, for example on the iron, kettle or a lamp. Replacing a plug or fuse on small household items can be done by a competent person. This guide is here to assist you and keep you safe. Always follow the instructions provided with your appliance and if you have any doubt contact an expert. We offer technical support for our website visitors. Go to Myelectronicstec.com contact page for more information. Always use a plug that meets BS standards and carries the Kitemark. If you are in the Sheffield area Myelectronicstec.com recommend that you visit Bardwell Electronics. Bardwell's address and contact details can be found on our web site. In the event you live elsewhere then Maplin Electronics, Wilkos or any other reputable supplier is your next port of call. To visit Bardwells click blue text above after reading this guide. First ensure the appliance is unplugged from the power supply. You will need a sharp knife, preferably a Stanley knife, a suitable sized screwdriver and wire cutters if you have them. Remove the old plug. This can be done by simply cutting it off from the cable or unscrewing the case and removing the wires. You now need to prepare the cable. If you have cut the plug off, using the Stanley knife carefully score all the way round the outer insulation, approximately 50mm (2 inches) from the end. Take great care not to cut the inner wires known as the conductors. You should be able to gently remove the outer insulation so that the blue, brown and green wires (conductors) are showing. Cut the blue, brown, and green conductors to the length indicated by the instructions included with the plug. Where you have removed the old plug by unscrewing the case you should not need to prepare the outer cable. It may only be necessary to ensure the conductors are neat and tidy i.e the metal strands on each conductor are tightly twisted together. If in doubt cut off the cable and follow the instructions above. Note: it is critical to get the right colors to the right pins. See diagram above. Using the wire cutters strip each conductor so as to bare around 6mm (1/4 inch) of copper wire on each conductor. If you do not have wire cutters use a sharp knife and follow the instruction for preparing the cable detailed above. Gently twist all the copper strands of wire in a circular motion so as to capture all metal strands before inserting into the brass hole of each pin conductor. No strands of wire should be left lose. Now using a suitable screwdriver secure each conductor by screwing the grub screw until it is tight. Gently tug each conductor to ensure the connection is tight. Double check that your colors match the diagram above. Some appliances may have only 2 conductors (blue and brown) for example some lamps. Match the colors as in the diagram as in blue and brown.If in the event your colors are different to these as in an old lamp then our repair division. If your appliance has a green wire you must always connect this wire to the appropriate terminal as this wire provides the earth protection. Lastly after checking all connections are right, and secure. fasten the cable grip to remove strain from the cable in the event some one pulls cord. How to replace a fuse and when. Safety first. Having switched off the power point & unplugged the appliance, carefully examine the plug for scorch marks, or burning, if in doubt call Myelectronicstec.com technical support line. 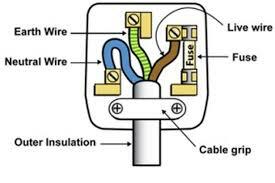 A fuse is a safety device designed to protect you from a dangerous fault. Never substitute a fuse with tin foil or any other object. To do so could cause a fire, or the death of a person through a lethal fault. The fuse in the plug of your appliance will have been matched at the factory to the wattage of the appliance. Essentially UK plugs come with three size fuses. Always replace a fuse like for like. Never replace a fuse with a higher rated fuse. The fuse sizes in the UK are as follows. Red 3 Amp fuse, Black 5 Amp fuse, Brown 13 Amp fuse. To replace the fuse locate a suitable screw driver and carefully remove the screw under the base of the plug. Normally it will be the larger screw. Turn the screw anti clockwise and the plug will come apart after several turns. Take careful note to see that no scorch marks are present or burn marks. Also check that no strands of copper are lose where they enter the brass conductors. Ensure that screws holding conductors are tight. Lastly if possible check the appliances instructions as to the correct fuse to use. As a guide replace like for like i.e. a 3 Amp fuse with a 3 Amp fuse. Re assemble the plug. Ensure the power point is switched off before inserting the plug. Do not touch the appliance when switching the power point back on. What if the fuse blows again? Stop! If the fuse blows a second time the device has a fault. Switch off the power point and remove plug. Do not allow anyone to use the appliance. You have a faulty and potentially dangerous appliance. Call Myelectronicstec.com technical support line for advice. If you are a business you should be aware of OHS PAT procedures. Myelectronicstec.com can ensure that all your electrical appliances meet OHS standards. For further information go to OHS PAT Testing on Myelectronicstec.com web page. Print this handy guide and keep it in a safe place. If in doubt call your friendly electronics experts for advice on 0114 360 5355. To print press CTRL + P on your key board. Due to overseas security contracts we are involved in that are deemed sensitive & confidential our workshop, and offices are not open to the general public. As such our sister company Sheffieldtvrepairs.com offer a pick up and delivery service.